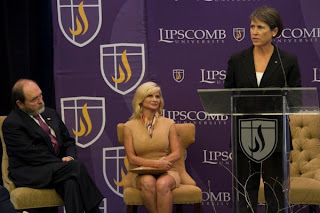 Friday, April 27, The Ayers Foundation held a press conference at Lipscomb University, with University officials announcing a new teacher development program in partnership with The Ayers Foundation. Through a $1 million gift from James and Janet Ayers to Lipscomb’s College of Education, The Ayers Institute for Teacher Learning and Innovation will place emphasis on helping educators in rural school systems and troubled schools in Tennessee. Institute programs will begin fall of 2012, according to Lipscomb’s College of Education. Ayers also noted; “We need to cultivate a culture of excellence among our teachers and school leaders, and a deeper appreciation of the value of learning in students and the community at large. We all know there is no competitive advantage to being average!” Ayers comment drew a standing ovation from the conference attendees. 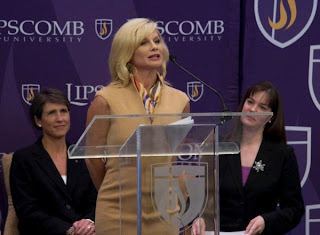 Janet Ayers - President, The Ayers Foundation, addresses the press conference at Lipscomb University April 27, 2012. 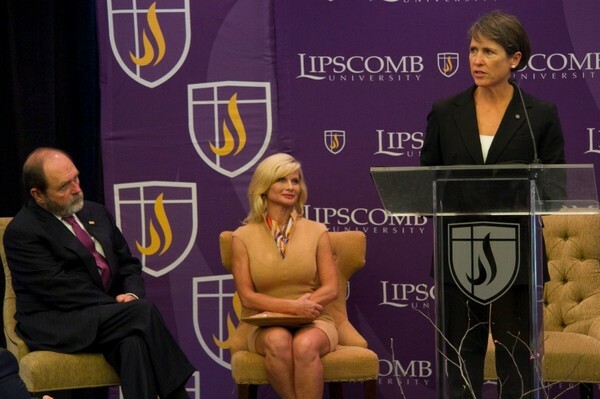 James and Janet Ayers of The Ayers Foundation, listen as Lipscomb University announces the new Ayers Institute. The Ayers Foundation was created in 1999 in Parsons, Tennessee to improve the quality of life in Tennessee with a focus on education, conservation and social welfare.